"Let it be shown...we chose to die on our feet...rather than live on our knees!" Gloriously employing Zack Snyder's style of slow-fast continuous shots, as well as taking the scale and dynamics to the next level, this is a worthy sequel to the awesome 300. It has pretty much the same weaknesses and strengths of its predecessor, but improves on what made the first film a success. A pretty obvious notion is that no other film does better with the long continuous shots of action with the occasional slow motions. This is a wonderful style to marvel on, for those who like these kind of things (I do!). This is the main reason I came to watch this, yet it is not the only thing that impressed me. But before moving on, I want to further claim that I seriously enjoyed these style of shots and frankly, all...ALL of the action sequences. They are just marvellous and glorious to watch and from minute one, I was attached and just smiling on every fight sequence. Still on the matter of action sequences, they are better in visual quality & dynamics of the setting, although I suspect the reason may be the budget and resource constraint on the first film. If Snyder had this the last time, it would be as good as this. Fortunately, Rise of an Empire, even in the hands of new director Noam Murro, didn't mess it up and brilliantly improves upon it. And though the quality of visuals were not perfect (such as the blood effects), the style is just so gratifying to watch. One last thing, the soundtrack is genuinely amazing, and is unbelievably fitting for the scenes. Even before the action begins, my heart pumps up, and during the fight itself, the soundtrack did good to enhance the suspense of the action. Words are not enough to explain it...you have to listen to it first hand. Actions aside, the plot was overall a straightforward one, except for those which relates to the original 300, which I was quite impressed of. Despite the lack of drama & humour, and the limited emotional range of the characters, some of the characters were great. 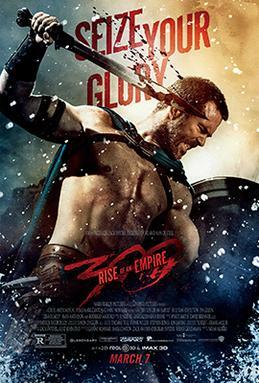 I was initially skeptical of the main character, and though he may not have outdone Gerard Butler's Leonidas, Themistokles is still quite the likeable action hero. And while I had a great feeling about the villain, Eva Green's Artemisia really stole the show on every scene she was in. As further praise, if the producers do intend to make another sequel, they will need one hell of villain to top off Artemisia. Overall, this is a very very entertaining movie, if what you're looking for is fun, action, and visuals. They did extremely well in these aspects, and make it such a wonderful film for a great time in the movies.